In addition to being a three-time All-Star for an Indians club that won six American League Central Division titles and two AL Pennants over his 13-year Major League pitching career, one of D-backs pitching coach Charles Nagy’s indelible memories of his time in Cleveland centered around fellow right-hander (and one of the game’s all-time greats) Bob Feller. The Baseball Hall of Famer, who passed away last December at the age of 92, broke into the league in 1936 as a 17-year-old fireballer from Van Meter, Iowa, pitching his way to 266 career wins, 2,581 strikeouts, a 3.25 ERA and eight All-Star appearances in an era that boasted the likes of Ted Williams and Joe DiMaggio. And he also missed four years of his pitching prime to volunteer to serve in the Navy during World War II. Still, Feller never strayed far from the game after his retirement in 1956. “In my rookie year in 1989, I first saw Bob in Spring Training,” Nagy began, “and he was out there shagging fly balls and talking baseball with all the guys. From that year on, it was ‘Hey, Bob’s in camp this week.’ All the guys would sit and chat with him. We had a really good relationship, and I always enjoyed talking to him. 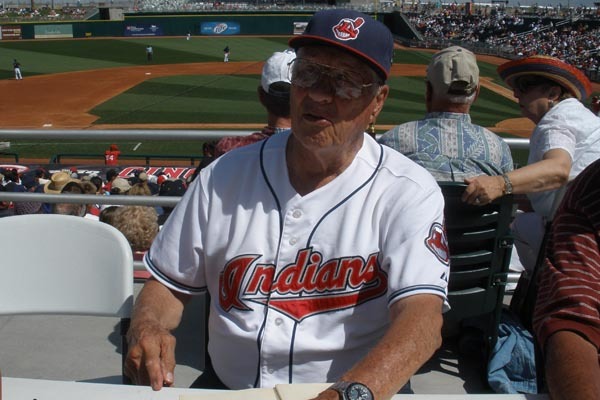 Nagy was certainly receptive to Rapid Robert’s advice, ending his career with 129 wins (10th on Cleveland’s all-time list) in 313 games before being inducted into the Indians’ Hall of Fame in 2007 – exactly 50 years after Feller’s similar honor.